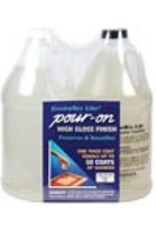 Pour On High Gloss Finish! Envirotex Lite is a water clear reactive polymer compound. It cures to a thick, glossy coating in about 8 hours at 70°F, and reaches full strength and toughness in about 48 hours. This durable, resilient material requires no polishing to produce a high gloss. One coat is all that is usually required for a deep attractive finish, however, two or more coats maybe applied one over the other by simply wiping the surface with a clean cloth and alcohol prior to re-coating.